Super Hero Boy: He did it!!!! HE DID IT!! He did it!!!! HE DID IT!! I've always said that Connor's advanced ability to follow simple directions is because we watched My Baby Can Talk and other sign language DVDs almost daily for months. Sadly we have gotten awfully lazy lately when it comes to being on our regular viewing schedule and honestly the fact that Connor has made no attempt to sign himself (thought he does understand quite a few signs) I decided unofficially that we were going to take a short break from signing shows. On Saturday however he almost made me fall out of my chair. We were at Pizza Hut of all places and they were taking exceptionally long to bring us our pizza (over an hour to be exact and we were only one of three tables seated) and Connor was getting pretty hungry so I hijacked him a plate at the salad bar. After eating a few bites he looked down at his hands and made the obvious sign for "more" and I almost screamed. Did he just do that?! So I held up his drink and I said "Do you want MORE drink Connor?" and he did it even more obvious this time. I have to tell you after all that time we spent working on signs I was more excited about this development than I ever was over his first word or even his first step. Finally.. he is truly understanding and replying to my commands. The feeling was amazing. I mean I have known for some time he could understand what I was telling him to do, but other than a random word here and there we have never really "talked" this was directly the first time he asked for something in a "word" mind you it was a signing word.. but still a word non the less. It felt amazing. So I'm back on the wagon with our Baby Signs!! Along with our DVDS we have a whole new tool in the signing game. My Baby Can Talk has a three book series now available to use along with the DVDS or totally on their own. The books are a great learning too as you can use them as a standard picture book and point to the pictures and say the names as well as the sign for the pictures is on each page as well. So you can point to the apple, then make the sign for apple which I have found is the best way to not only learn words but signs as well. The real benefit to signing is that most babies may not be able to say a word but fully understand the word and may be able to sign the word before they could ever say it. In Connor's case we have been really struggling with the "mm" sound. Thus saying "Mommy" or "more" has been very difficult for him. I actually thought for the longest time he couldn't say "mommy" but turns out he was saying it all along just replacing the "mm" with "uhh" which sounded more like a whine than a "momm" .. which translated to something like "uhhh uhhhuu" which has slowly become more like "muhh muhh" and most recently a "mommm mommm" though he is still most defently still struggling with "mmm" so its neat to see him using the "more" sign. 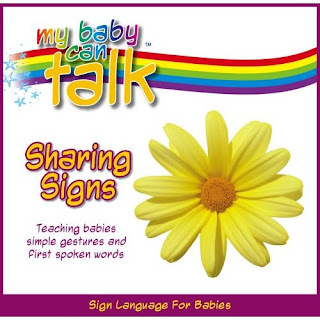 The My Baby Can Talk books come in single editions from the most basic First Signs book which covers most of the signs that is included in the first dvd including : eat, drink, more, go, and some animal signs. If you are only looking to add one book to your collection I would highly recommend this one as it covers the most basic signs you can use on a daily basis. The other two books in the series Sharing Signs and Exploring Signs build on the basic vocabulary given in the First Signs book. Sharing Signs includes more "command" signs such as bath, ball, please, and thank you. Exploring Signs is focused more on colors and the world around you. At $26.95 for the whole set it seems silly only to buy one or two but regardless at $9.95 a book its a cheap and worth wild investment for any baby or toddler. Obviously its never too early to start showing your baby signs as Connor watched his almost daily from six months till most recently and he still remembers. Now I can't wait to see what other new signs pop up in vocabulary in the next few weeks and months. 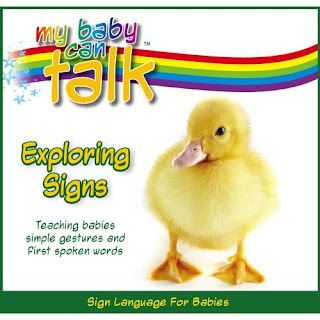 You can purchase your copy of My Baby Can Talk : Signing Books at the My Baby Can Talk website! I have a whole set of My Baby Can Talk Board Books to give away to one reader!! Believe me you will LOVE them. Leave a comment on this post. 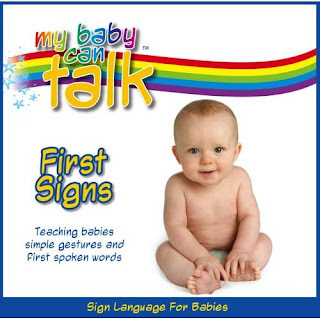 Check out the My Baby Can Talk Board Books and tell me what was your child's first word or if they can sign what did they first say? Oh my goodness! I want to teach my little one signs. I know ASL, but they seem to complicated for her. My daughter's first sign was for milk. I'm guessing that's a common one. Her first word was "baby" and she'd say it loudly anytime we passed a kid that looked less than about 5 years old. She still does that, but has become a little more discriminating. Now baby is any kid being carried or in a stroller. We are SO pro-baby signing at our house! My daughters' firsts signs were milk and more, but they know many more now (and I think it helped them as they began to talk too)! I believe that either "more" or "milk" was my 2yo first sign (I taught him both at the same time). Unfortunately, the 2nd child refuses to sign. He thinks it's completely acceptable to grunt and nod LOL I could sure use any help I can get! If Mama counts as a first word. That and Bye bye are about the extent of my babe's vocabulary. We're working on signs, but so far he hasn't done any. Our DD is 15 months old now and she has about 25-30 signs that she uses. Her first sign was EAT at 5 1/2 months old - we were so excited! If these books are basic, I'd love to win them to give to my sister who just found out that she's expecting in the spring! My daughter is 2 now, so she tells us what she wants, but still signs while she is talking (especially when we don't understand her.) Her first word that she signed was "eat"-a very important one! :) I'm working with my little guy now. Well my little one isn't old enough to talk yet, so I can't share her first word, so I will share mine when I was young, it was do which ment dog to me, since I had a really loving dog! He only can sign up, sometimes. My daughter's first word was "BaBa" which was the name she used for her brother, Alby. I like the "First Signs" book. My son is 10 months old and the only thing he says is AWWW when he hugs you. I'd love to teach him more! My nine year old daughter Sage's first word was book. I'm a librarian, so you can imagine my delight! Of course, she turned into a very reluctant reader, but oh well. My daughter is four months old and so isn't at that communicating (at least with words - cries and babbling, yes! lol) stage it. :-) I would love to win this and teach her sign language! My grandson just said his first word and it was no. That was funny. My daughter's first work was mama, her second word was kitty. Dog was his first word followed by "Enyuck" for milk. my first DD said"Onak" because her dad's name is "Ronak"
My daughters first words were dada and mama. little girls first word was eat eat. My daughter just did her first sign for milk last week. We were so excited and can't wait for more signs. My oldest was "dada" and my baby's was "uh-oh!" Thanks for the contest! First word besides mama was ball and first sign was milk. The first thing my little boy said was, "Kitty"
my baby could sing please, more and all done! My daughter is 16 months old now. I still remember where she did her first sign. My sister had shown her how to do "more" but it didn't even seem like she was paying attention. But at a restaurant while eating fetticcine alfredo (lol) she signed more! I, too could not believe it & was ecstatic! Her first word was duck when she was 11 months. Now she won't stop talking lol! As a mom, children's fantasy book lover and reviewer, we would like to send you a complimentary set of our Planet Of The Dogs book series, including the latest, Volume 3, Snow Valley Heroes- A Christmas Tale. Please send us a postal address via our email: barkingplanet@aol.com and we will send you the books. For more information please visit www.planetofthedogs.net and http://barkingplanet.typepad.com. PS: Ironically, we have a two and a half year old grandson named Connor. He has a younger sister, Clio, but no chihuahuas. My oldest daughter could sign before she taled, and it was milk! My younger daughter is 8 mo, and is not signing, but makes lots of noise! My daughter delayed in speech so we have been doing some common signs since she was very young. Her first sign was for eat! Thanks for the great giveaway! my middle one was the only one that said mama first. The other two it was dada. I think all of them said baba (bottle) first though. Weirdly enough, my son's first sign was for socks! (Two fingers/hands rubbing together like putting a sock over a foot) I always used this when dressing him and one day he copied me! Then, quickly, he learned MORE and MILK and DOG and lots more! My daughter's first word. My brother-in-law and lives with us and my daughter adores her Uncle Nick. When she tried to say his name instead of "Uncle Nick" she calls him "Cucca". My grandson signed long before he spoke - MORE and HUNGRY were his first signs. What a great way to communicate with them! I always thought baby signing would be a great thing and so far it has been. His first sign was "more" though it has now morphed into more of a clap... He does "all done" now too. Would love to increase his vocabulary! My 5 year olds first word was dada and my 8 month old can say 4 words, his first was baba. I would like to win this not only to teach my 8 month old how to comunicate, but I would like to use it to teach my 5 year old and myself some sign language. It's something that we could all do together, and it's useful. My daughter said mama first and my son said ball. All I ever taught my daughter to sign was "milk." I'd like to teach my 7 month old to sign too and really should start. My daughter's first word was "Oli" our dog's name! My oldest fist word was Dot (for his aunt), my youngest said maaaamaaaa first. I am working with my youngest on signs, because her speech is very behind. These would be great! it was either daddy or doggy, they sounded the same! We're still waiting on the first word from our youngest but if she keeps up with her three older brothers it will be "Daddy". That was the first word for all three of them!